Ophthalmic drugs can be confusing (and difficult to spell!) in terms of their use and when to use which one. The goal of this article is to make practical recommendations for a selection of ophthalmic drugs used for common conditions. What should I use for a routine corneal ulcer in a dog? In general, a broad-spectrum antibiotic such as neomycin-polymixin B-gramicidin solution is a good choice. Another good choice is tobramycin or gentamicin. Solutions are preferable to ointments for corneal disease and are easier for owners to administer. Antibiotics are used to prevent infection of ulcers, since bacteria and viruses rarely cause ulcers. Solutions should be used four times daily during waking hours. What should I use for a corneal ulcer in a cat? 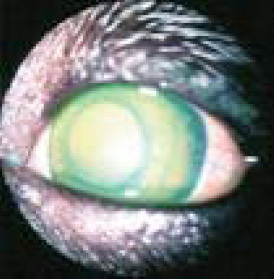 Anti-virals: Most corneal ulcers in cats are caused by feline herpes virus; anti-virals are essential. Most anti-virals are virostatic necessitating frequent application. 1% triflurthymidine and Viroptic® every 3 hours for the first 24 hours, then every 4-6 hours. Both cidofovir and idoxuridine are available from compounding pharmacies. Triflurthymidine is commercially available at pharmacies. Cats should be treated for two weeks after epithelialization is complete. Cats may get secondary bacterial infections due to Mycoplasma and Chlamydia. Effective drugs for these bacteria include topical fluoroquinolones (ofloxacin, ciprofloxacin, moxifloxacin, etc. ), terramycin (currently difficult to obtain), and erythromycin. The fluoroquinolones are solutions and are used four times daily. Terramycin and erythromycin are ointments used 3-4 times daily. What antibiotics should be avoided in cats? Neomycin-polymixin B-gramicidin/bacitracin has been implicated in anaphylactic reactions and death in cats with topical use. This medication combination has been in use for years. The mechanism of this reaction is unknown. What should I use for an indolent corneal ulcer? You should use the drugs listed above under routine corneal ulcer. The choice of antibiotic rarely makes a difference in these ulcers as they are more akin to a broken leg than an infection. The issue is adherence of the new cells. Debriding the epithelium, creating a grid keratotomy, and placing a soft contact lens are the most important components for successful healing in a reasonable amount of time. What if the ulcer is deep or melting? These patients are usually best treated by hospitalizing and giving topical fluroquinolones. Moxifloxacin (expensive, Vigamox®), or ofloxacin (generic available and inexpensive, Ocuflox®) are preferable to ciprofloxacin due to better efficacy, spectrum, and penetration into deep corneal layers and even the anterior chamber) every 2 hours around the clock for the first 24-48 hours, then every 4 hours until signs of infection are gone, then every 6 hours until one week after corneal epithelialization. Most pet owners can’t possibly do this without being on the brink of exhaustion. 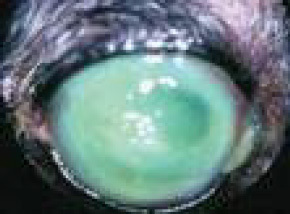 The best course of action is to refer these patients as they may require corneal grafting surgery and need 24 hour care. The fluoroquinolones should be reserved for severe infections to decrease the chance of resistance. Already, ciprofloxacin has decreased in efficacy. This class of drugs affects adherence of migrating epithelial cells during corneal healing and should be avoided in indolent ulcers. What should I use for corneal pain? Topical 1% atropine solution decreases corneal pain by blocking ciliary spasms inside the eye in response. Solution is used in dogs, ointment is more frequently used in cats. Ointments travel down the nasolacrimal duct less than solutions, so are less likely to produce the salivation and foaming reaction to the bitter taste when the drug reaches the mouth. Cats are more sensitive to this atropine effect. Small dogs may become tachycardic or systemically atropinized (both pupils are dilated instead of just the one being treated). Punctal occlusion is recommended. This technique involves applying firm pressure over the medial canthus for 1-2 minutes to block the punctal exit to the nose and mouth. An additional benefit of this technique is the increased absorption of the ophthalmic drug in to the eye. The frequency of atropine use is determined by the degree of inflammation or miosis, but is a minimum of once daily until the ulcer is healed. Topical nalbuphine, once touted as helpful for corneal pain, has been shown recently to be toxic to the corneal epithelium, and not that helpful. Oral tramadol is useful for treating corneal pain and is a good alternative when atropine is contraindicated as in dry eye patients. What should I use for glaucoma until the patient can get to an ophthalmologist? The most effective anti-glaucoma agent is one of the topical prostaglandin analogues including 0.005% latanaprost (Xalatan®), bimatoprost (Lumigan®), or travoprost (Travatan®). These are used every 12 or 24 hours with every 12 hours more common. If used once daily, use at night to avoid the photophobia and vision restriction that can occur with the profound miosis produced by these drugs. Miosis in the presence of an anterior lens luxation can constrict the pupil around the vitreous that also moves forward, raising the intraocular pressure. These drugs can decrease IOP by 50% in glaucomatous dogs. Their use is questionable in cats due to lack of scientific support of their efficacy, however, there is some clinical support for their use if the drugs below are not helpful. Most feline glaucoma is secondary to anterior uveitis, making the use of a prostaglandin analogue contraindicated due to the potential inflammatory effects in an already inflamed eye. The topical carbonic-anhydrase inhibitors (CAI) reduced IOP by about 40-50% in the glaucomatous dog. These drugs do not change pupil size, particularly helpful if the lens is luxated or if its position is uncertain. Dorzolamide (Trusopt®) has an acidic pH that tends to cause stinging. It comes in generic form and is less expensive than brinzolamide (Azopt®). Azopt does not tend to sting, possibly leading to better owner and pet compliance. The CAI drugs are usually used every 8 hours. It is important to specify this interval since some pet owners interpret “3 times daily” as breakfast, lunch and dinner, leaving a long interval between the “dinner” and “breakfast” dose. 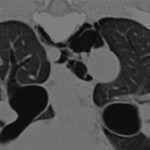 Timolol (0.5%) produces a minimal decrease of only 4-5 mm Hg in glaucomatous dogs. If a 4-8% concentration of this drug was available, it could be helpful, however it would likely produce systemic side effects. There are much more effective drugs that do not have the potential for causing bradycardia or exacerbating respiratory problems (asthma, COPD) as this betablocker does. Monotherapy with timolol is ineffective for canine glaucoma. Timolol is available as a combination drug with dorzolamide one of the topical carbonicanhydrase inhibitors (CAI). This combination (Cosopt®), is helpful due to the CAI but does not allow alteration of the frequency of the individual drugs in the event of side effects such as bradycardia. A combination drug consisting of latanaprost and timolol (Xalacom®) has been introduced recently. In a study presented at the 2009 ACVO meeting, latanoprost alone was as effective at lowering IOP as the latanaprost/timolol combination in normal dogs given twice daily. Glaucomatous dogs react differently than non-glaucomatous dogs to therapy, so this needs to be studied in glaucomatous dogs. The important part of this study was that timolol will cause a significant (22%) decrease in heart rate in normal dogs. 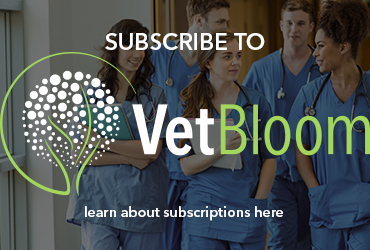 This is important considering the breed population that often presents with glaucoma, such as cocker spaniels with pre-existing partial A-V block. 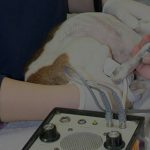 In small breeds, the amount of topical drug absorbed compared to their body weight can cause bradycardia. This is another instance when punctal occlusion is helpful. Anti-inflammatory therapy is the mainstay of uveitis treatment. Effective topical agents include 1% prednisolone acetate solution and dexamethasone (0.1%) sodium phosphate solution. These drugs are used every 4-6 hours around the clock depending on the severity of the inflammation. This is continued for two weeks, then slowly tapered to avoid rebound inflammation. Atropine is also used for uveitis, not only for ocular pain, but to return the uveal blood vessels to their normal permeability by stabilizing the blood-aqueous barrier, and to dilate the pupil to decrease synechiae formation. Topical NSAIDS are less effective than corticosteroids for decreasing inflammation. They can be used to help prevent inflammation or control lowgrade lens-induced uveitis in diabetics, or cats at risk for herpes reactivation via topical corticosteroid use. Oral NSAIDS are quite helpful in uveitis cases. Oral tepoxalin (Zubrin®) is the most effective of the NSAIDS in decreasing intraocular inflammation according to one recent study. Oral corticosteroids are helpful of course, but systemic disease must be ruled out before their use. This is by no means a complete list of ophthalmic drugs, but hopefully it will help you with daily clinical conditions. What drug should I use to dilate the pupil for diagnostics? Tropicamide (1%) is the drug of choice as a short-acting mydriatic-cycloplegic. It takes 20-30 minutes for maximum effect and lasts approximately 8 hours. Topical 1% atropine can last up to two weeks in the uninflamed eye and should never be used for diagnostics. What drug should I use as a topical anesthetic? Topical proparacaine is the least toxic to the corneal epithelium of the topical anesthetics. It takes 6-11 seconds to work and lasts 20-30 minutes. Tetracaine has been implicated in anaphylaxis and death in cats as an idiosyncratic reaction. Incidentally, topical anesthetics should never be used therapeutically for corneal pain due to their toxic effects on the epithelium and the development of a refractory state after a few applications.